AMY Ahomiro won the Finals Most Valuable Player of the UAAP Season 77 women’s volleyball tournament but insisted she was never after the individual plum. The Lady Eagle from New Zealand said the finals MVP is just icing on the cake, as the main goal was to win the UAAP crown. “I’m very honored to win this award. But it’s all teamwork. The championship was our main goal,” said Ahomiro. “This is just extra ‘sarapness’ on the side,” Ahomiro said. Ahomiro had 10 points, three from service aces, in the second match of the finals to help the Lady Eagles win their second consecutive crown in the UAAP. 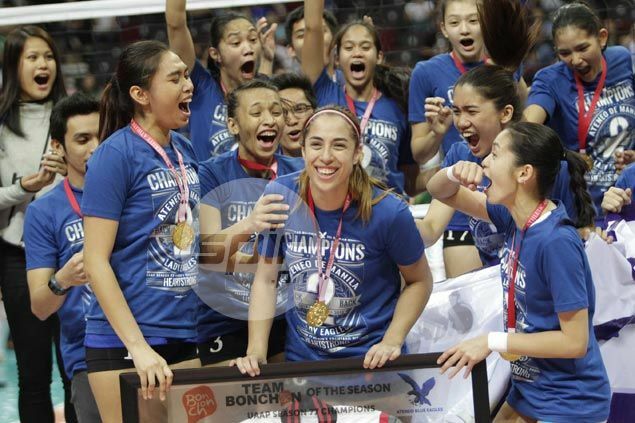 The Lady Eagles captured the UAAP crown undefeated by winning all 16 matches, besting the 14-0 record set by La Salle in 2004 when league rules stated an outright title is given to the team who sweeps the elimination round. “We feel honored to have this opportunity. We definitely worked hard for it but the other teams also worked hard. “It’s a weird feeling being undefeated but we never went into the game thinking that we want to go undefeated,” said Ahomiro. During the postgame press conference, teammate Alyssa Valdez was asked about her stint in the Philippine national squad. It was there when Ahomiro joked about her hope about playing for her native land’s national squad. “I’m not Filipino. I’m from New Zealand. Sana national team sa New Zealand,” Ahomiro said with a laugh.